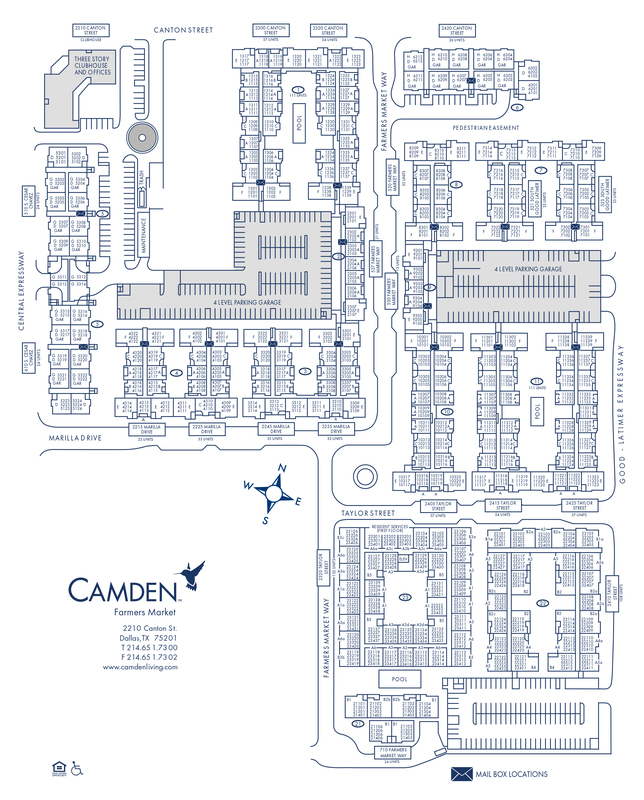 For the best one, two and three bedroom apartment homes in Downtown Dallas look no further than Camden Farmers Market located in the heart of Deep Ellum, next to the Dallas Farmers Market. Be within walking distance of live music venues, art galleries and restaurants - all just outside your front door. The Contemporary Style features white granite countertops with white subway tile backsplash, espresso shaker cabinets with nickel hardware and Whirlpool stainless steel appliances in the kitchens. Also included are white quartz countertops and large rainfall showerheads in the bathrooms, LED lighting, crown molding and more! The Modern Style features granite countertops, stainless steel appliances and modern hardware and fixtures. Off-white walls with white crown molding as well as USB outlets and curved shower rods provide a modern look with all the conveniences. The Loft Style is highlighted by 10-foot ceilings with exposed ductwork, stained concrete flooring and pendant lighting. Glass-top stoves, spacious walk-in closets, ceiling fans, framed bathroom mirrors and a full-size washer and dryer are included in every apartment home as well. Wanting the best view of the Dallas skyline? Look no further than your own private balcony at Camden Farmers Market. Amenities at Camden Farmers Market are where convenience, luxury and fun come together! We have three resort-style pools all surrounded by lounge chairs and expansive sun decks. No need for that separate gym membership when you have three fitness centers so you'll always have a place to unwind or get a great workout in! We make it easy to catch up with friends by using the indoor sports court for a quick pick up basketball game and private movie theatre! Looking to host a friendly competition? Check out this virtual tour of our resident gaming lounge to come up with your next get-together. Your pets enjoy resident perks as well, living across the street from the Deep Ellum Dog Park. Residents receive a money-saving technology package that includes high-speed internet with speeds up to 45 Mbps and over 300 digital video channels with HD and DVR through AT&T U-verse. Use the AT&T U-verse app on your smartphone or tablet to access your digital video anywhere! Enjoy concerts at local music venues like The Bomb Factory, Trees and Three Links, all just blocks away from your apartment home. Check out events at American Airlines Center, Dos Equis Pavilion and Klyde Warren Park, just a short drive away. The best nightlife, dining, and entertainment scene in Dallas is right at your fingertips in the thriving Deep Ellum neihgborhood. Come home to Camden Farmers Market where life gets a lot more exciting! We'll save a spot for you! We offer one parking space per leaseholder in our parking Garages. Visitor parking is located on the top floors of each Garage.